The Panorama of the City of New York, a scale model of the city created for the 1964 World’s Fair, is one of the many cool things on display at The Queens Museum. For the 1964 World’s Fair, Robert Moses, the famed “master builder” for metropolitan New York and the event’s president, wanted something big to showcase the city. He commissioned a panorama scale model of the city that took a team of more than 100 people over three years to complete the model, which covers 9,335 square feet (one inch equals 100 feet). That scale model, officially called the Panorama of the City of New York, is still on display today at the Queens Museum. The model has been updated over the years – last in 1992 – and still is awe-inspiring. It is one of my favorite things to show visitors to NYC. Interior of The Queens Museum. The Queens Museum is much more than a home for the most amazing scale model ever built. The museum is also a showcase for many contemporary and modern artists. Many of the exhibits are short term, so there is always something new and exciting to see at the museum. On a recent visit, we saw an exhibit on Indian art spanning 1947-1997 and another exhibit showcasing the work of Robert Seydal. There are other permanent displays that make a visit to the museum worthwhile, in addition to the scale model of New York City. The original Tiffany factory used to be nearby in Queens, and the museum offers a beautiful display of Tiffany glass, along with information about the company and the former factory. 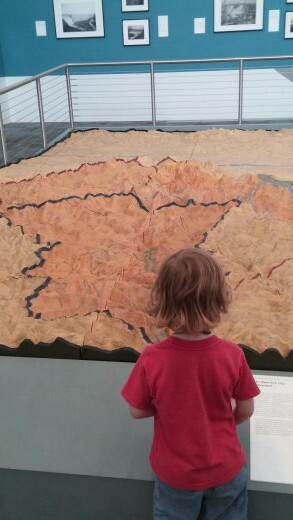 Another scale model of the NYC Watershed shows how New York gets its water. And, of course, a collection of mementos, pictures, and information from the ‘64 World’s Fair can be found within the museum. To see everything the museum has to offer, allocate about two hours. The museum enjoys a robust community partnership and budding artists can take part in family workshops on Sundays from 1:30 to 4:30 p.m. The Queens Museum is in Flushing Meadows Corona Park, the site of the 1939 and 1964 World’s Fairs. It can be tricky to find for those that are unfamiliar with the area, so for directions, click here. The surrounding park, the largest in Queens, is also home to the Queens Zoo, the Queens Botanical Garden, the New York Hall of Science, Citi Field (home of the Mets), Arthur Ashe Stadium (home of the U.S. Open), and, of course, the iconic Unisphere. By combining a visit to the Queens Museum with other activities available in the area, visitors can easily spend an entire day enjoying Queens. For tickets, the suggested price is $8 for adults and $4 for students and seniors. Kids under 12 are free. Hours are from noon to 6 p.m. Wednesday through Sunday. There is a small café with reasonably priced snacks and beverages inside the museum, and the small gift shop carries a mix of art-inspired mementos and jewelry and original 1939 and 1964 World’s Fair Memorabilia. A version of this first appeared on One Good Dad. Jason Greene has been a stay-at-home dad for more than 8 years. He blogs at One Good Dad. You may follow him on Twitter as @thejasongreene.